"Politics is the art of the possible," Otto Von Bismarck famously said, and here, in his own words, the art of politics is laid bare by one of the most prominent and influential European statesmen of the nineteenth century. These are the intimate reflections and reminiscences of the man who unified the independent Germanic states into one nation, and whose subsequent promotion of the new country's colonial ambitions earned him the title of the founder of the German empire. 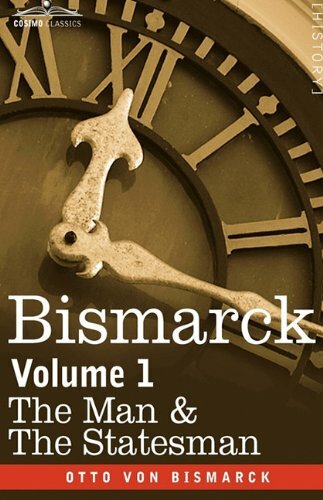 This two volume set of what must be considered an essential historical document details Bismarck's early life, from the political views of his youth and his entrance into public life through his work in government ministries and his time at the Court of Munich. It is vital reading for any informed, in-depth understanding of modern European history. AUTHOR BIO: OTTO EDUARD LEOPOLD VON BISMARCK (1815-1898) was born into a family that had belonged to the nobility from the fourteenth century. He studied law at the Universities of Göttingen and Berlin, and later served as prime minister of Prussia, from 1862 to 1873, and as Germany's first chancellor, from 1871 to 1890.